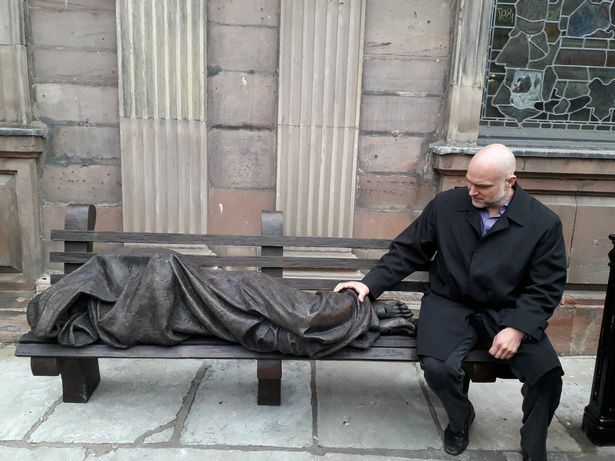 A sculpture of a homeless Jesus sleeping on a bench has been unveiled outside St Ann's church in Manchester after a service of dedication by the bishop of Manchester. The sculpture by Timothy Schmalz depicts a figure lying on a bench, with its pierced feet indicating it is Jesus. Churches across Greater Manchester are active in caring for homeless people and St Ann's itself is working on a pilot project that will provide a warm space, hot drinks and toast early in the morning before any of the city's day centres open. Archdiocese officials declined to disclose the price of the bronze statue, but versions of "Homeless Jesus" on display in other cities have cost as much as $40,000. 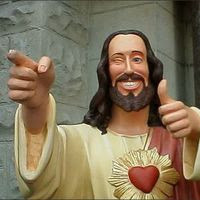 An anonymous donor purchased the permanent statue on behalf of the archdiocese. The piece was paid for by an anonymous donor and St Ann’s has raised the funds to put it in place. But you'd probably have to do more than show pierced feet for people to get the idea the figure was supposed to be Jesus of Nazareth. *Not the first on that continent, as it turns out. That distinction goes to Glasgow; the city, not a church. No mention of the cost of that statue, except that funds were raised to get the statute, cast in Canada, to Scotland. Turns out, too, there are already 75 statutes from India to Australia. Hmmm. Matthew 25 is why I believe. It is my understanding of all of the rest of it, the unfolding of the Golden Rule and all of it.